High fibre. Unsweetened. Whole grain. Clean ingredients. No refined sugars. Non-GM. 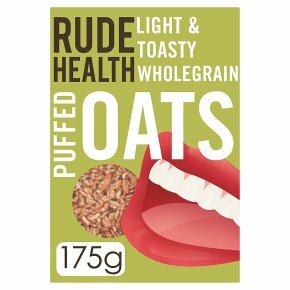 No added salt or sugar - contains natural sugars from oats. No artificial anythings. Vegetarian Society approved. Kosher - KLBD.Pure pleasure Toasty, nutty, subtle and light, each and every one of these pure puffs is the grain, the whole grain, and nothing but the grain. Thanks to our top secret popping method, the sensation is oaty and floaty, while the fibre is kept intact: soluble, insoluble, satisfying, cholesterol-lowering, heart-loving. No added anythings, so you can add your own choice of sweet somethings. Know your oats Oats do good things to your insides - just ask your heart and your gut. Oats can also do wonders for your outsides. An oatmeal bath can moisturise and soothe irritated skin, while an oatmeal face-mask can help to heal sunburn or blemished. Treat yourself to a bit of oaty bodywork. Oat Symphony Oats are packed with two kinds of fibre. The soluble variety absorbs water, slows down digestion, helps lower LDL cholesterol and makes you feel fuller for longer. The insoluble stuff brings movement to your movements. Let's call it a symphony. How we like them Honest to goodness: tip into a bowl and drench with your favourite milk. The toasty taste is naturally sophisticated. Like minimalism, but edible. Sweet as you like: maple syrup, honey, date syrup and banana make for a breakfast bonanza. Beyond breakfast, dive into oat cuisine! We toss Puffed Oats into our chewy no-bake high energy bar.